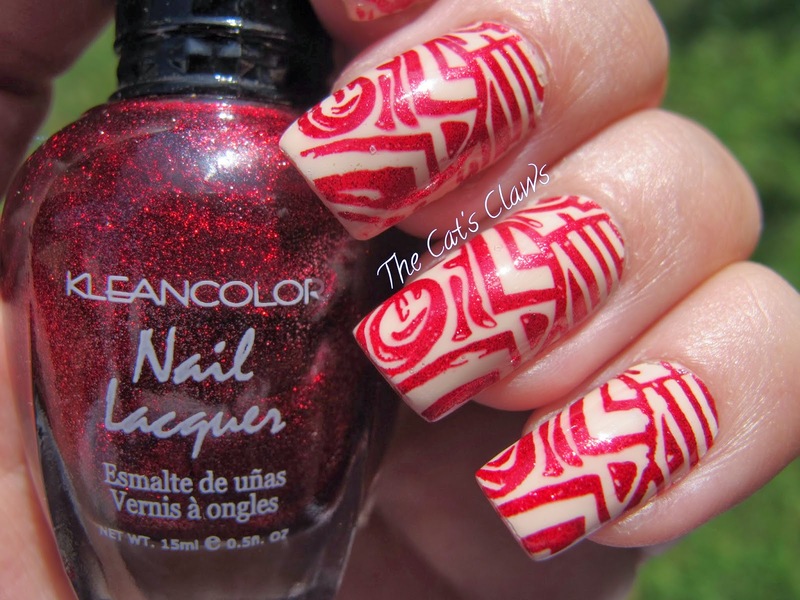 OMG will you look at this, I can't believe that this stamping turned out to be so awesome! I am so stoked that I finally have some stamping that looks professionally done. And I must admit I am hooked! And MoYou London has become my new best friend! So what did I use? I hear you all ask, OPI My Vampire Is Buff three coats then a coat of Seche Vite. I stamped MoYou London Explorer Collection 12 (an Aztec design plate) with Kleancolor Metallic Red followed by, half an hour later, another coat of Seche Vite. Who knew stamping could be so easy lol once you have the right tools! 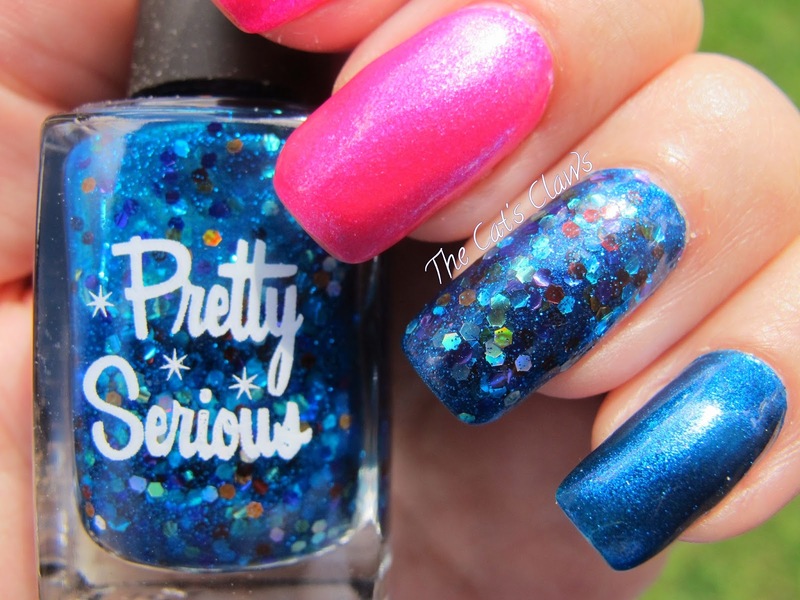 Well you can't get more colourful than Pretty Serious The Pink One, I had been lemming it for such a long time and then it was back in stock! The Pink One hasn't disappointed me one iota. It is seriously pink!! And just too make doubly sure that the pink really popped I first used Sally Hansen White On as a base... I'm not totally convinced I needed to do that so the next time I'll skip that part. So while I was grabbing The Pink One what other pretty colours did I pick up? Well I couldn't get past Rae's Rainbow without it falling into my cart! 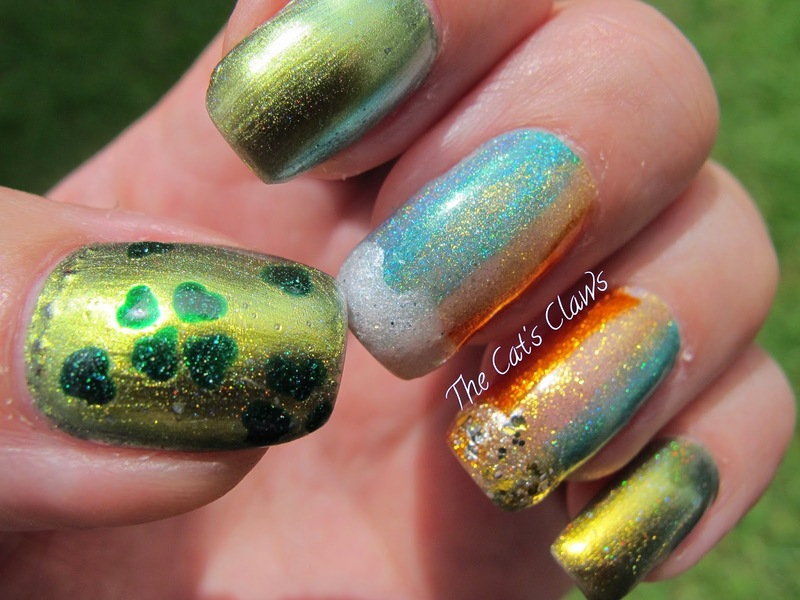 Probably not shown in its full glory here having layered it over OPI Swimsuit Nailed It! 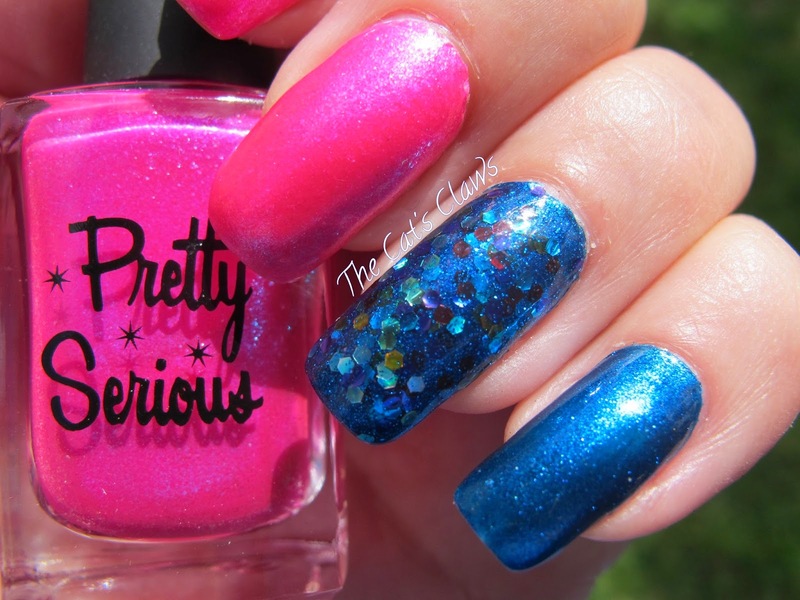 Rae's Rainbow is a glitter topper predominately blue but with all the colours of the rainbow in and super sparkly, just the kind I adore. A gratuitous shot of them all sitting in the sun! 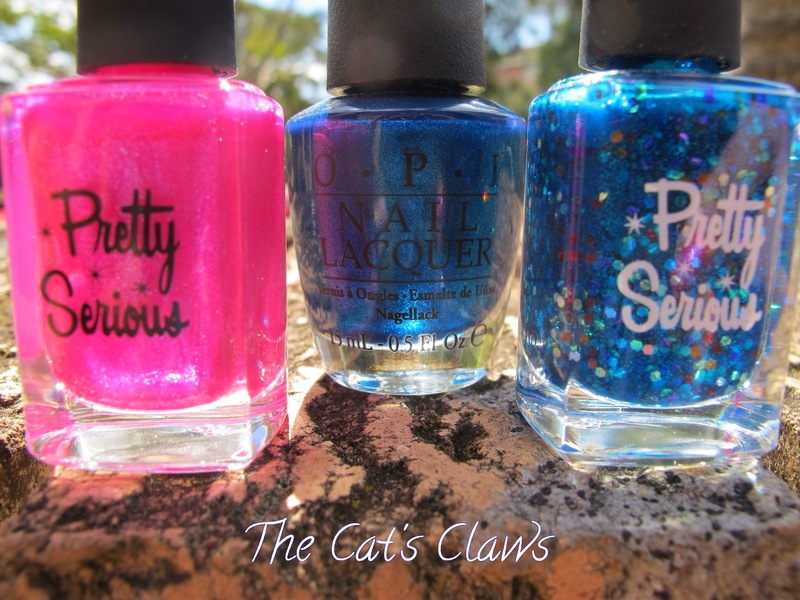 On to my mani then, thumb, ring and pinky two coats of OPI Swimsuit Nailed It! followed by two coats of Pretty Serious Rae's Rainbow on my thumb and ring finger (I was originally only going to do an accent nail but it was just too pretty). On my index and middle finger two coats of Sally Hansen White On then two coats of Pretty Serious The Pink One. All topped off with a coat of Seche Vite. 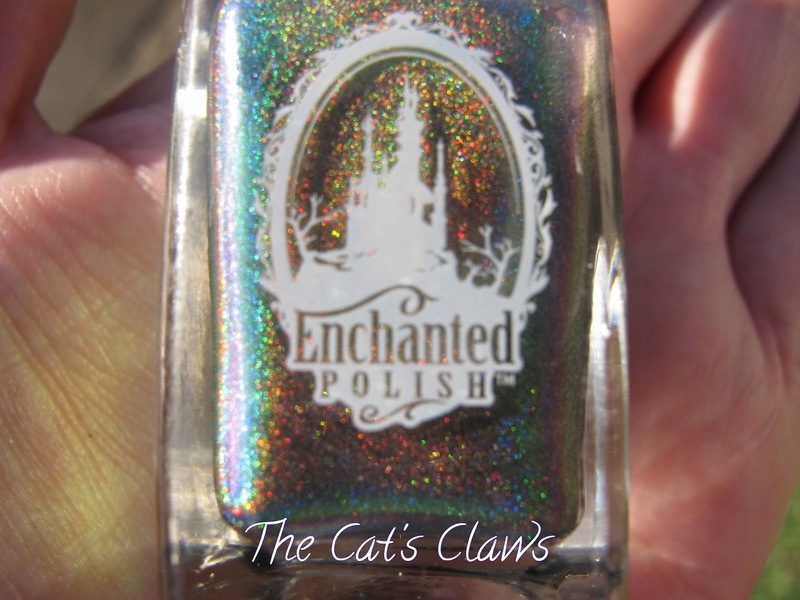 and is a Limited Edition Polish with $5 from every Polish sold going to www.jdrf.org.uk a charity to fund research that will cure, treat and prevent type 1 diabetes and its complications. So St Patrick's Day has rolled around once again and this time not only had I planned my nails in advance, I actually did them too! I'm super impressed with my organisational skills this time. 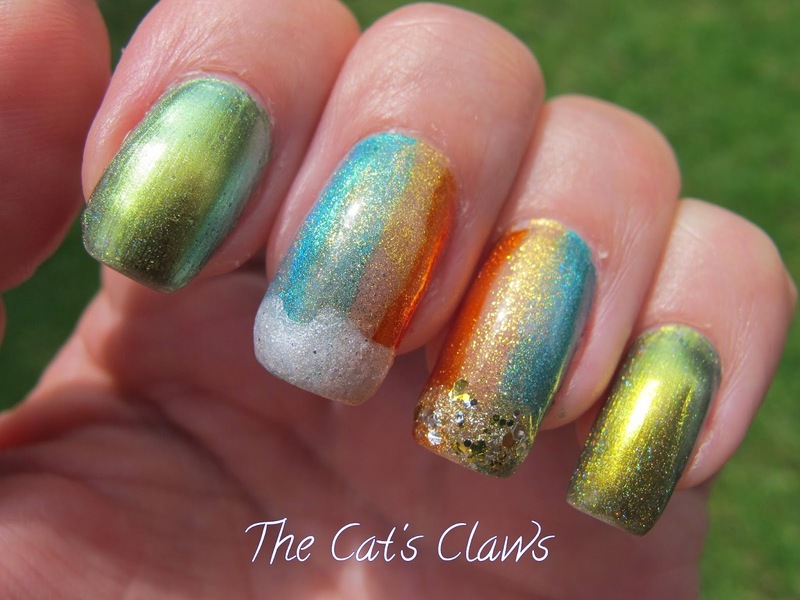 The rainbows inspiration came from Tips and Topcoat's beautiful mani. 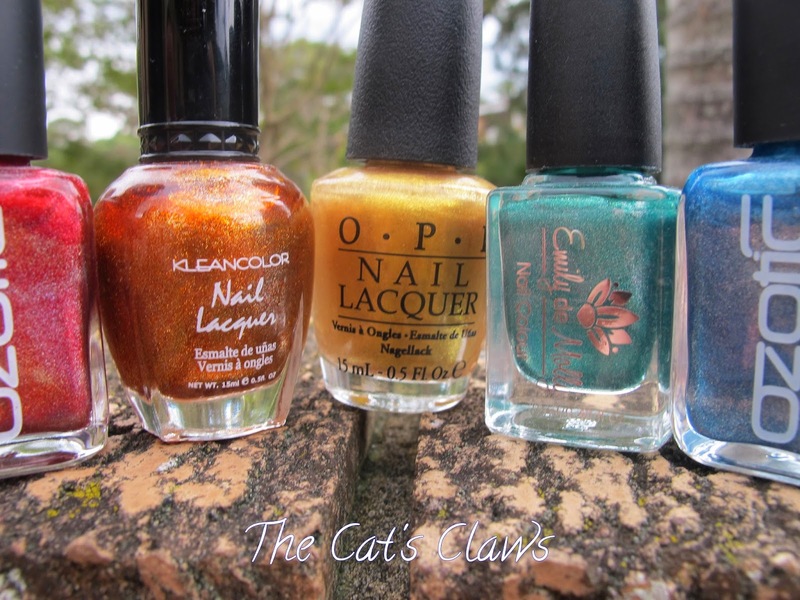 I used ten yes TEN different nail polishes of which five used for the rainbow are pictured here: they are Ozotic Pro 515,518 Kleancolor Metalic Mango, OPI Oy-Another Polish Joke! and Emily de Molly Land of Confusion. The other five used were David Jones Goldfish and Ulta3 Show Stopper for the pot of gold. OPI Solitaire for the clouds. 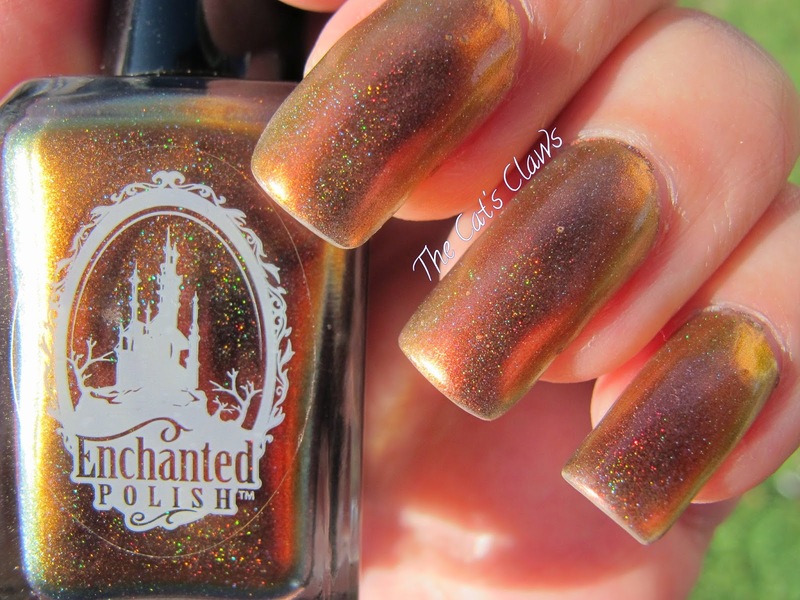 My index and ring finger were just plain, if you could ever call Enchanted Polish Mean Mr Mustard plain! 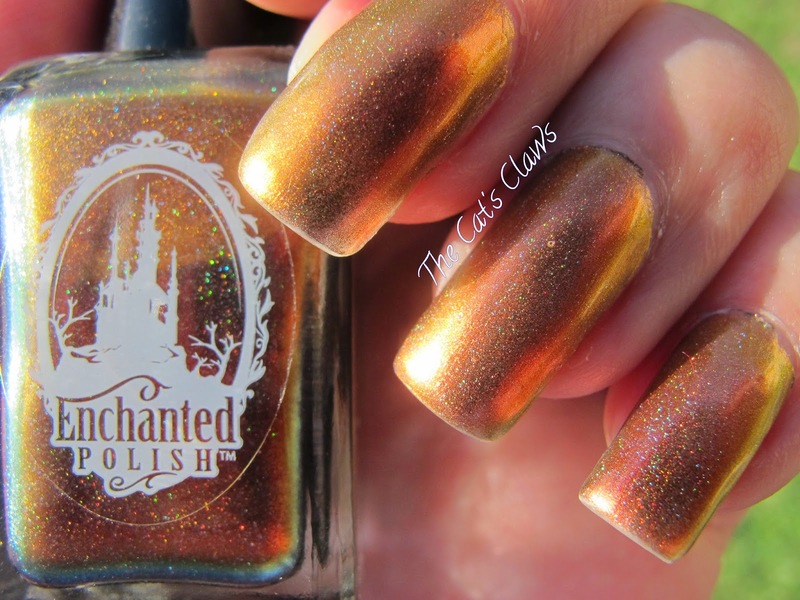 And my thumb was Enchanted Polish Mean Mr Mustard with Picture Polish Kryptonite free hand four leaf clovers and hearts. With the all important Seche Vite top coat to protect my mani. 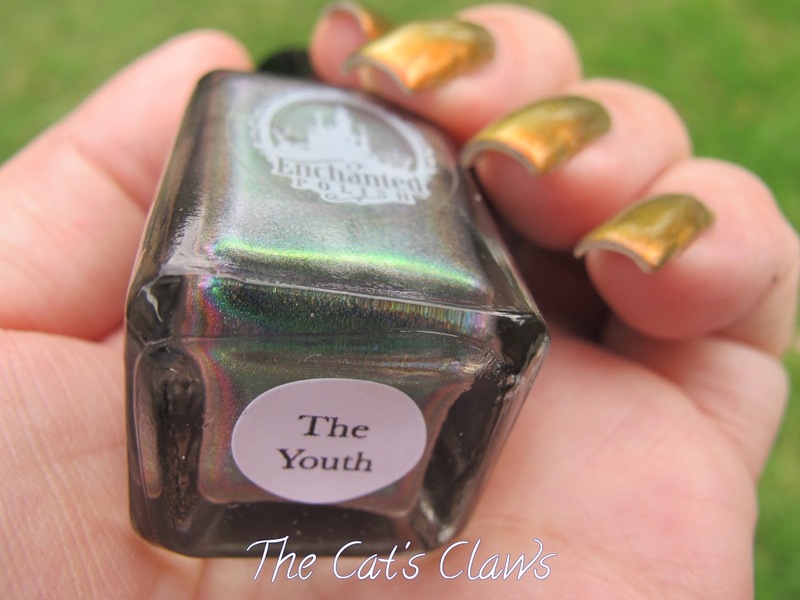 May the Luck of The Irish be with you in my International Give Away! 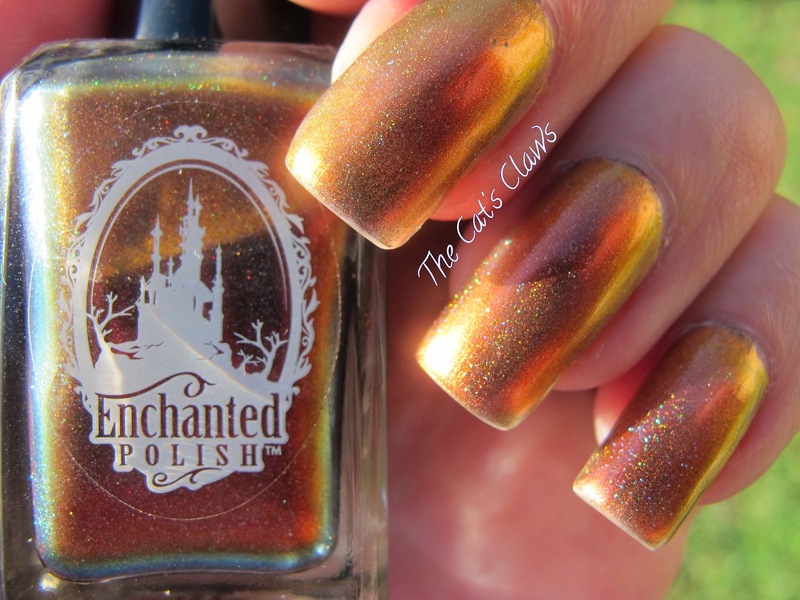 Enchanted Polish I Am The Walrus a rich gold/orange duochrome with holographic goodness, what more can I say apart from "Lets bask in its awesomeness"! My nails have been bathed in sunlight all week and it is one of those polishes that you can't help yourself staring at! On to my mani then before I get too carried away, three coats of Enchanted Polish I Am A Walrus followed by a top coat of Seche Vite. The Give Away will start on her birth hour! I know how can OPI Thanks A Windmillion be a failure, I mean I had seen everybody's drool worthy photos and decided it was a polish I couldn't live without!! I adored the soft fern green colour and then I went and spoilt it by adding Lynnderella A Neutral Party (a complex glitter bomb of copper and neutral tones) as an accent. My bad! 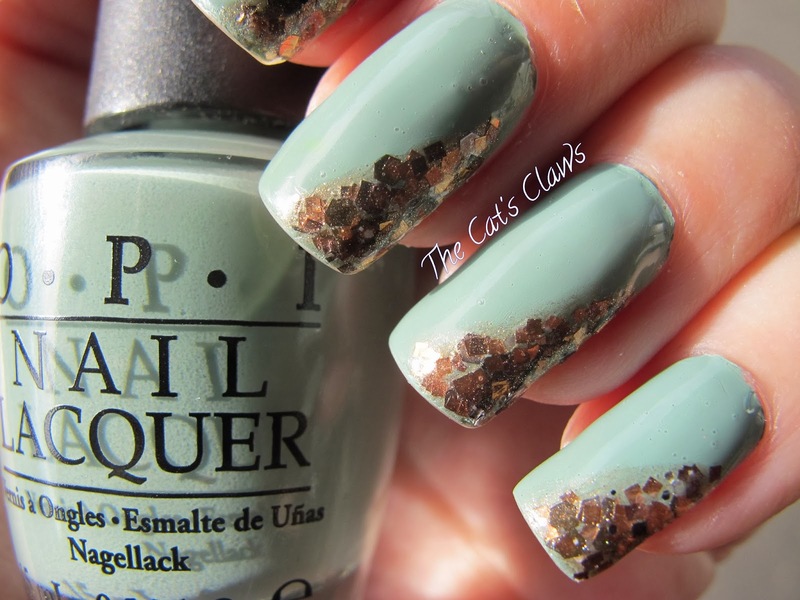 OPI Thanks A Windmillion really does not need any embellishment at all! On to my mani then two coats of OPI Thanks A Windmillon then a freehand accent of Lynnderella A Neutral Party followed by a Seche Vite top coat. Yes this is Emily de Molly Split Personality and I can't believe how long it has been sitting in my untried's basket (months). 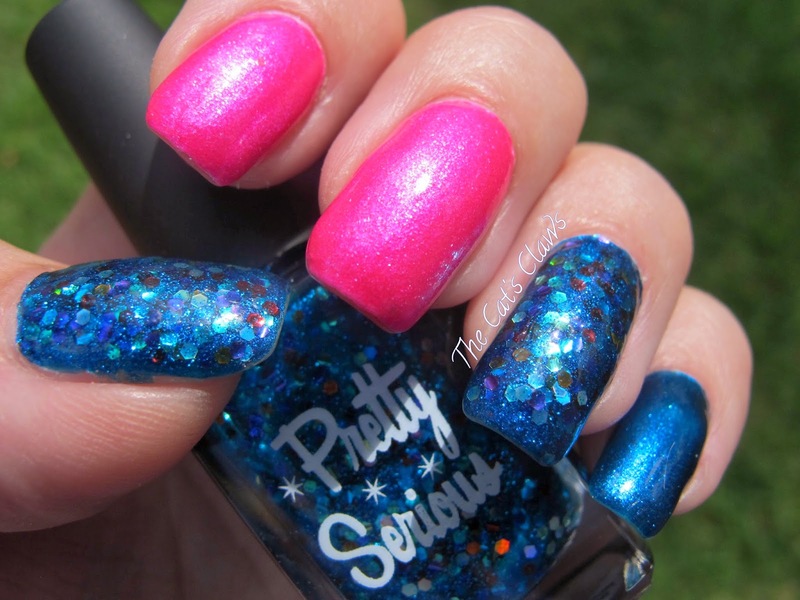 Split Personality is so pretty being a blue base with a ton and I do mean a ton of pink shimmer in it plus copper coloured flakes. Split Personality really can not make up its mind whether it is blue or purple!! This was three coats of Split Personality followed by a Seche Vite top coat. 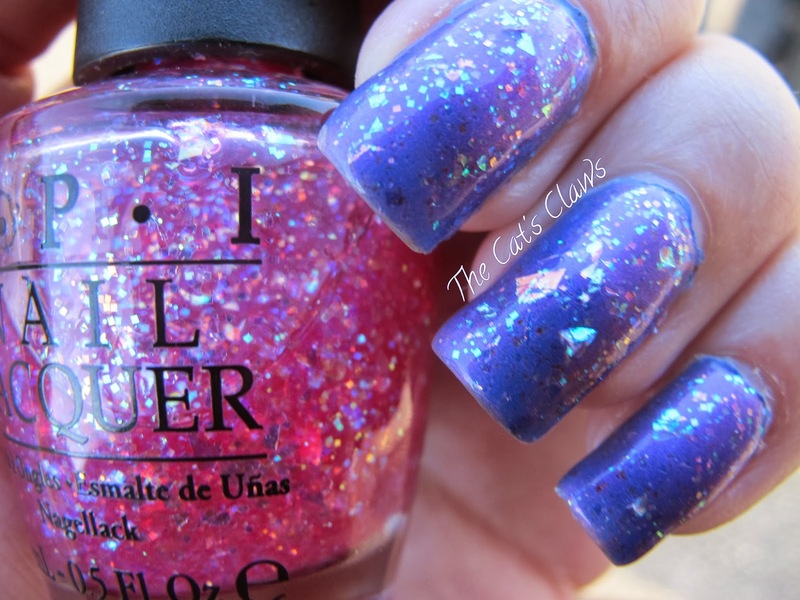 Yep going out and no time to change my mani means I layered on OPI I Lily Love You, which is a pink base with holographic flakes although layered on top of Split Personality the flakes took on a blue tone. Followed by a coat of Seche Vite to make my mani all glassy smooth. Please stop by next week as I have a very special giveaway planned!! On The Edge Of Our Seats! Life has been far too busy again, but I hope you haven't suffered too much while you wait for my posts! And I have so many mani's to show you too. 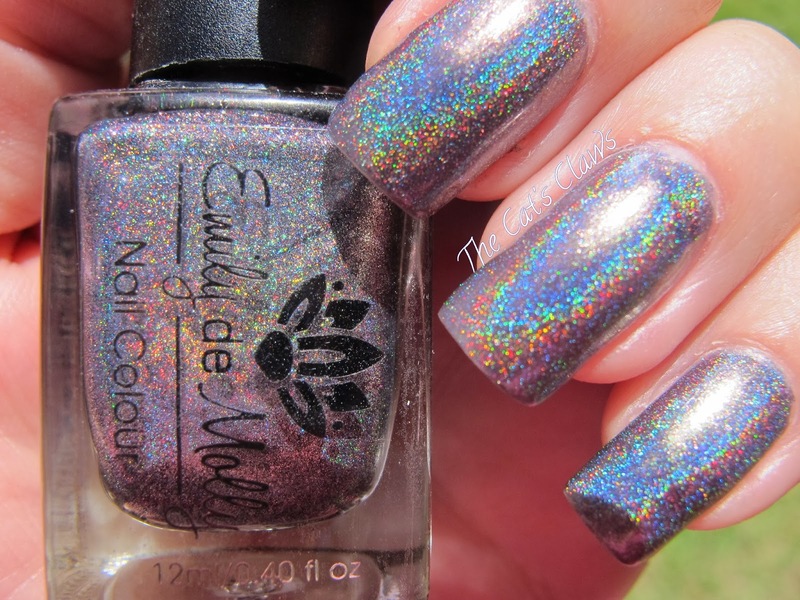 The first one I'm going to showcase though is the lovely holographic polish by Emily de Molly namely On Edge, obviously worn when the weather was much nicer. 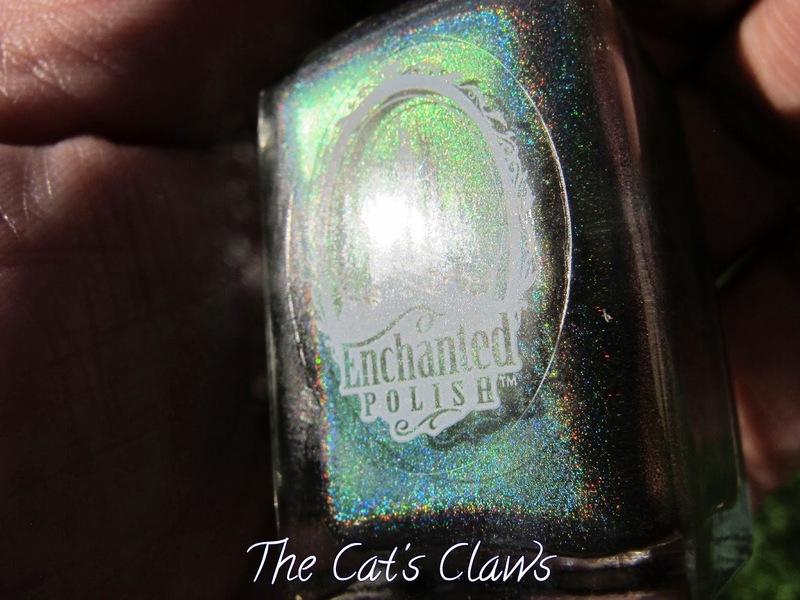 On to my mani then, two coats of Emily de Molly On Edge a grey green holographic polish that really blazes in the sunlight. (I could stare at my nails all day when the holographic blaze is this good) Followed by a Seche Vite top coat which did not dull the blaze at all!